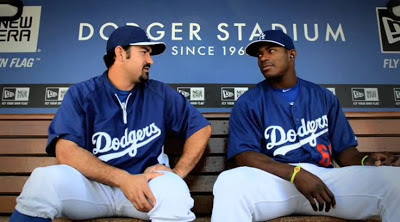 Puig isn't listening to Adrian Gonzalez in this commercial, but he sure as hell isn't listening to Bruce Bochy. Maybe ever. "I would have a hard time picking somebody who has been here three weeks, to be honest," Bochy said. "The numbers would have to be so stupid that you say, 'OK, I'll consider it.' But, you know, I couldn't take away from a player who has been here and done it the whole half and been out there grinding every day and he doesn't go. I couldn't look at that player. I couldn't look at myself, to be honest. So that's why I'm saying, that's a really long shot." On face value, that's not that crazy of an comment. Except it involves the meteoric young player on the arch-rival Dodgers. And suddenly, it's controversial. Not to mention just the kind of bulletin-board material you want a non-English speaker to tape to his locker. Tonight, Puig made sure Bochy saw what he could do, up close. In the first inning, Brute 66 took the third pitch he saw from Madison Bumgarner into right field for a solo HR. The Giants scored in the top of the second, and the game stayed 1-1 until the eighth inning. In the bottom of the eighth, Puig had men at the corners with none out and broke the 1-1 tie with a ground ball to left, scoring Nick Punto from third. The Dodgers added another run when Hanley Ramirez grounded to short, scoring Mark Ellis (who had advanced to third on a wild pitch). Puig ended up going 3-for-4 with 2 RBI and is now batting .442. Kenley Jansen nailed down the ninth despite a wild pitch giving the Giants a fourth out. Hyun-Jin Ryu went 6.2 IP and gave up 8 H, but only 1 ER, 4 BB, 2 Ks. Even more surprisingly, Don Mattingly's calls all worked out well tonight: Ronald Belisario pitched 0.2 IP and had two Ks; Paco Rodriguez then pitched another 0.2 IP and got 1 K; and Jansen had a nice ninth, with 3 Ks. The baseball gods were smiling on the Dodgers; Buster Posey was on second base in the fifth inning when Pablo Sandoval singled to center, but Posey slipped rounding third and fell. Brandon Crawford (in for the injured Joaquin Arias, who pulled a hamstring in the first inning scoring the Giants' only run) then hit into a 1-2-3 GIDP (the Giants had two GIDP in tonight's game). Dodgers win three in row for only the second time this year. Could we stretch it to an unprecedented four wins in a row? Be still my beating heart! Evelyn Taft is on. Win! There is a sting in the PGT. Was there in person. 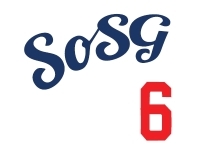 Puig let the streak succeed! @Neeebs: What sting? I thought I was pretty positive! Leaving the stadium now. Wanted to make that winning feeling last! Ugh. Can't type on my kindle. NLTS.